Bluetooth Thermometers - Your HACCP ... Simply Re-Invented! Comark have a range of Bluetooth Thermometers. In conjunction with the Bluetooth app, these devices transmit their temperature data to you iOS or Android device. Used in conjunction with the Comark Kitchen Checks App the user can automate data collection allowing for a mobile and flexible temperature monitoring solution. Manage all your HACCP temperature recording with the Comark range of Bluetooth thermometers using apps easy to follow checklists. A handy pocket digital thermometer, Bluetooth thermometer, waterproof thermometer, food thermometer, catering thermometer…all rolled into one …combined with a HACCP app! 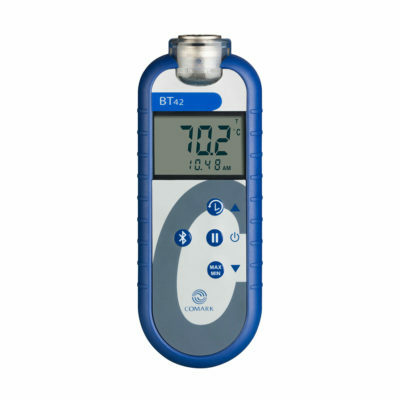 Designed for use as a food thermometer/catering thermometer within food production areas, the BT125KC Pocketherm Bluetooth Thermometer transmits temperature data via Bluetooth to your Android or iOS phone or tablet. Take our best Food Thermometer and add Bluetooth for a whole new experience. 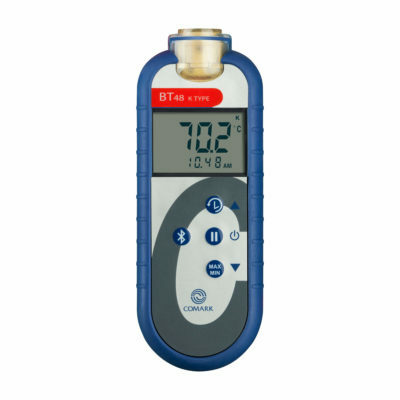 Take your HACCP Temperature recording to the next level with the new BT42C Bluetooth Food Thermometer. Eliminate Pen, Paper and Human Error from your Kitchen with Comark Kitchen Checks App and BT42C from Comark. The New BT48C Bluetooth Industrial Thermometer has the features you need, including MAX, MIN and HOLD functions, for improved convenience. BT48C has a 4-button design for simple operation and is powered by 2 AA batteries. Includes a Bluetooth for connection to the Comark Kitchen Checks App. 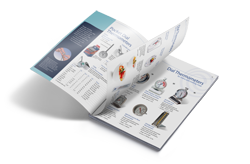 For most professional use cases, a food thermometer needs to be used in a specific and controlled manner and the temperature data collected at source. This makes a secure data transmission protocol such as Bluetooth an ideal solution for busy and flexible working environments. By using the operating systems of mobile phones and controlling and collecting data via an accurate data transmission format, Bluetooth thermometers add controllability and convenience. Collecting the temperature data on an iOS or Android mobile device for analysis or sharing. The Comark Kitchen Checks App can be installed on modern phones and tablets meaning there is no need to buy a separate base unit. Bluetooth Thermometers use standard Bluetooth device coupling which ensures both accuracy of data transmission and security. Bluetooth thermometers work in real time, transferring data at up to 24Mbit/s. Comark’s range of Bluetooth thermometers have a maximum range of 100 meters (328 feet) though walls or other obstructions might reduce this. Setting up the app could not be easier. Simply scan the QR code from the registration process and your HACCP plan and users will set up automatically. The app will connect to your Bluetooth Thermometer so that the temperature recording is wireless and fool-proof. This helps control dry-labbing and record falsification. HACCP is a codified set of methods and procedures used by the food industry that ensures that food is handled and stored correctly. Ensuring that consumers have a product that is safe for consumption. Businesses that create, manipulate store, or distribute food will be subject to inspection from HACCP enforcement officers for example environmental health staff. These inspectors are tasked with ensuring that there is a robust and understood HACCP procedure in place and that it is being followed. The inspection criteria also ensure that staff are trained, and that appropriate equipment is available to those staff that need it. 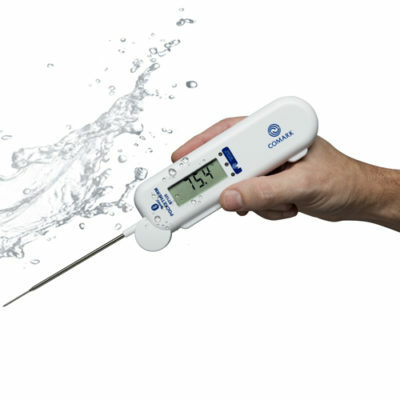 In many cases thermometers are a critical requirement for HACCP compliance. There is also a requirement for record keeping, and these records are also subject to scrutiny. Comark has over 50 years’ experience and understands the demands placed on food businesses in this busy sector and produces a wide range of instruments from simple dial thermometers through to automated data collection equipment.